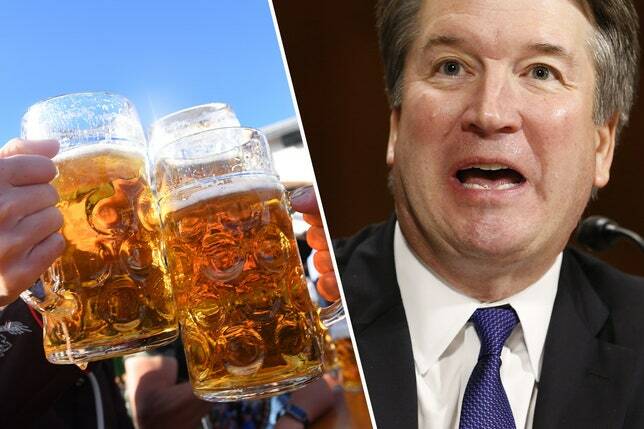 Brett’s Beer Drinking Buddy Says Kavanaugh Binged, Was Belligerent, And Blacked Out – Coercion Code – "Dark Times are upon us"
With Washington in a frenzy over the FBI’s probe of Judge Kavanaugh, which according to Judiciary Committee Chairman Chuck Grassley would be no more than a week long and would be limited solely to “current credible allegations”, a new and potentially explosive allegation has emerged. Late on Sunday, Charles Ludington, a former varsity basketball player and friend of Kavanaugh’s at Yale, told the Washington Post that he plans to deliver a statement to the FBI field office in Raleigh on Monday detailing violent drunken behavior by Kavanaugh in college. What prompted this latest last minute memory “recollection” by a peer of Kavanaugh’s? According to the report, Ludington was deeply troubled by Kavanaugh appearing to blatantly mischaracterize his drinking in Senate testimony. The NYT also got an interview out of Ludington, and reported that Ludington said he frequently saw Judge Kavanaugh “staggering from alcohol consumption” during their student years. He said he planned to tell his story to the F.B.I. at its office in Raleigh, N.C., on Monday. During last Thursday’s hearing, Kavanaugh was agitated by questions from Democratic senators about his history with partying and drinking, at one point asking Sen. Amy Klobuchar (D-Minn.) if she has ever blacked out due to alcohol consumption. It is unclear if his testimony will play a role in the weeklong FBI investigation into allegations of sexual assault against Kavanaugh, the Times reported. Several other classmates in recent days have accused Kavanaugh of misleading Congress over his alcohol consumption. Former FBI Director James Comey in a Times op-ed published Sunday charged Kavanaugh with “lying” under oath. And while it is too early to determine what, if any, impact this latest statement to the FBI will have on Kavanaugh’s candidacy, it would stand to reason that there is only so much opposition that the Supreme Court candidate can take before even he decides that the SCOTUS seat is just not worth the constant anguish and media spotlight. At least, that’s what democrats are hoping. “Sometimes I had too many beers. Sometimes others did. I liked beer. I still like beer. But I did not drink beer to the point of blacking out, and I never sexually assaulted anyone.” Meaning, he was just a boy being a boy, doing boyish things—nothing more. I have been contacted by numerous reporters about Brett Kavanaugh and have not wanted to say anything because I had nothing to contribute about what kind of justice he would be. I knew Brett at Yale because I was a classmate and a varsity basketball player and Brett enjoyed socializing with athletes. Indeed, athletes formed the core of Brett’s social circle. In recent days I have become deeply troubled by what has been a blatant mischaracterization by Brett himself of his drinking at Yale. When I watched Brett and his wife being interviewed on Fox News on Monday, and when I watched Brett deliver his testimony under oath to the Senate Judiciary Committee on Thursday, I cringed. For the fact is, at Yale, and I can speak to no other times, Brett was a frequent drinker, and a heavy drinker. I know, because, especially in our first two years of college, I often drank with him. On many occasions I heard Brett slur his words and saw him staggering from alcohol consumption, not all of which was beer. When Brett got drunk, he was often belligerent and aggressive. On one of the last occasions I purposely socialized with Brett, I witnessed him respond to a semi-hostile remark, not by defusing the situation, but by throwing his beer in the man’s face and starting a fight that ended with one of our mutual friends in jail. I do not believe that the heavy drinking or even loutish behavior of an 18- or even 21-year-old should condemn a person for the rest of his life. I would be a hypocrite to think so. However, I have direct and repeated knowledge about his drinking and his disposition while drunk. And I do believe that Brett’s actions as a 53-year-old federal judge matter. If he lied about his past actions on national television, and more especially while speaking under oath in front of the United States Senate, I believe those lies should have consequences. It is truth that is at stake, and I believe that the ability to speak the truth, even when it does not reflect well upon oneself, is a paramount quality we seek in our nation’s most powerful judges. I can unequivocally say that in denying the possibility that he ever blacked out from drinking, and in downplaying the degree and frequency of his drinking, Brett has not told the truth. I felt it was my civic duty to tell of my experience while drinking with Brett, and I offer this statement to the press. I have no desire to speak further publicly, and nothing more to say to the press at this time. I will, however, take my information to the F.B.I. Additionally, as for his political affiliation, he appears to be a Democrat. The New York Times reported that Ludington has contributed small amounts to Democratic candidates in the past.